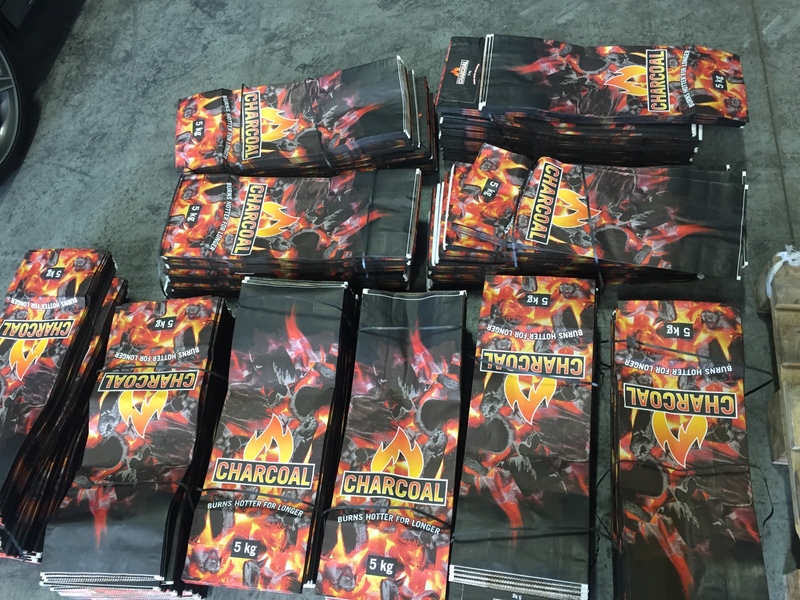 We have made it our mission to improve the Portable Kiln charcoal-producing-kiln and investigate ways to turn it into a biochar producing kiln. This system uses a ‘direct combustion’ method, whereby the heat for carbonisation comes from burning a portion of the biomass feedstock in a limited air environment. Vuthisa however decided to promote the plans for this basic drum system of producing charcoal and biochar so that others can build it and improve upon it. How often does it happen that somebody has a novel design idea, but often fails to effectively relay the concept to others for review? By constructing a standard kiln everybody is immediately on the same page. Join our exclusive community of Portable Kiln owners, known as the Portable Kiln Google Group for sharing ideas, innovations and improvements. Support this initiative by downloading the plans under Option A1 or Option A2 below, after making a small monetary payment to ensure exclusivity of its members in the Google Group and to cover the administrative costs associated with maintaining this website and this group. **Update** We have undergone trials with 2 x 55 gal oil drums enclosed within the Trans-Portable Kiln and have shared our findings on the Portable Kiln Google Group. 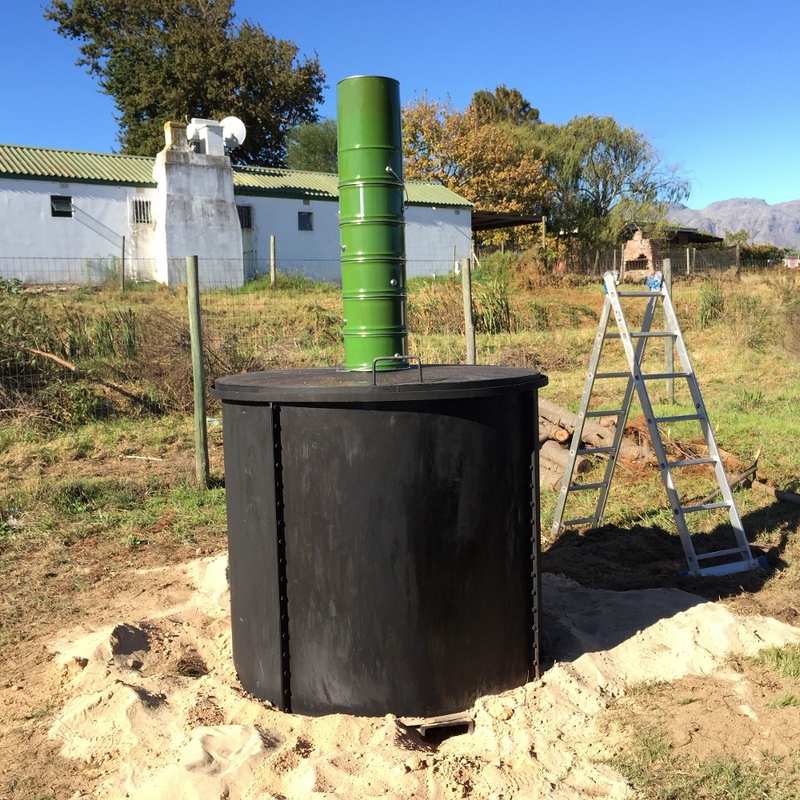 We have had very constructive input from Dr Hugh McLaughlin and other biochar experts (special thanks goes out to John Hofmeyr) and as a result have come up with the 3-drum Biochar Retort. 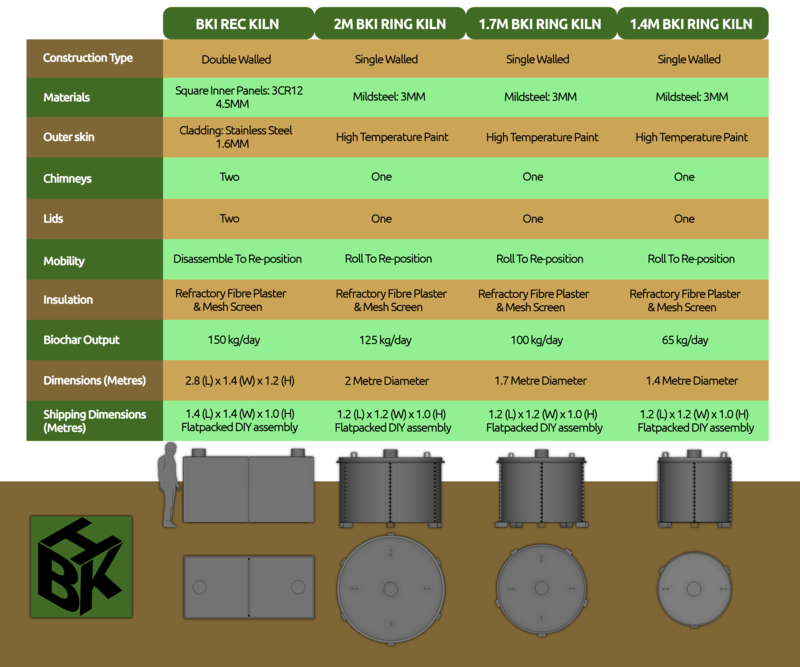 The extra open spaces (4 in total) created between the 3 drums will ensure sufficient fuel to evolve the heat inside the retorts, create multiple heating fronts and create more biochar in one burn. The feedback we received was incorporated into the ‘3-drum Biochar Retort Construction and User Manual’. The Portable Kiln method described in the opening paragraph (not the 3-drum Biochar Retort) is a simple, heavy gauge, mild steel drum with a square lid. The drum is packed with feedstock with varying thicknesses and bottom lit. Once the charge has burned for some time, white ash will start spilling out the primary air inlet holes. This is the cue that a fair proportion of the smaller pieces of feedstock have been totally consumed and that air now needs to be limited to prevent the rest of the charge to also turn to ash. Air is only allowed in from the open top of the drum and mixes with the volatile gases now coming off as part of the exothermic reaction. As soon as yellow smoke start appearing it means tars and hydrocarbons are now being given off. The lid is placed on top of the drum and the hydrocarbons are absorbed by the charcoal. The tars then also seal the lid flush with the top of the drum. Sand and stones are packed on to the lid to prevent the ‘soup mix’ spilling out. The heavy gauge steel retains heat for quite some time, allowing the contents to ‘cook’. To produce biochar many enthusiasts opt for the 55/30 system, which consists of a 55-gallon outer drum containing the fire around a 30-gallon inner drum acting as the enclosed retort. For examples of such systems visit: http://www.carbon-negative.us/Burners.htm and http://youtu.be/COPqvVH7jiw. We did some trials to produce biochar with the Trans-Portable Kiln which just so happen to be the perfect size to accommodate 2 x 55 gallon drums for making biochar with indirect heating, turning it into a retort type system. The drums were wedged in side by side and rolled along with the rest of the kiln. When not using the 55-gallon drums the system is not a true retort and produces more smokey burns. Hence the development of the 3-drum Biochar Retort. The 3-drum Biochar Retort is more clean burning (with the added conical lid and chimney) and the burn is more controlled, and the user has an option to create either Biochar or conventional charcoal. If the purpose of the operation is to clear invasive aliens then the open burn (without 3 drum retorts) will be able to process more feedstock at a time. Compared to the 55/30 system the Biochar yield is substantially more. The Trans-Portable Kiln and 3-drum Biochar Retort are easy to transport to the work site for assembly, and being circular in shape, can be rolled over fairly long distances with minimal effort and labor. It is a fairly low cost system and initial capital outlay is minimal compared to other commercial type kilns. We have been able to increase the longevity of the kilns, by increasing the gauge thickness, reinforcing the top and bottom of the kilns to make them more structurally secure when re-positioning the kiln. We also have strict guidelines for setting-up procedures, feedstock re-fueling, and general handling of the kilns. 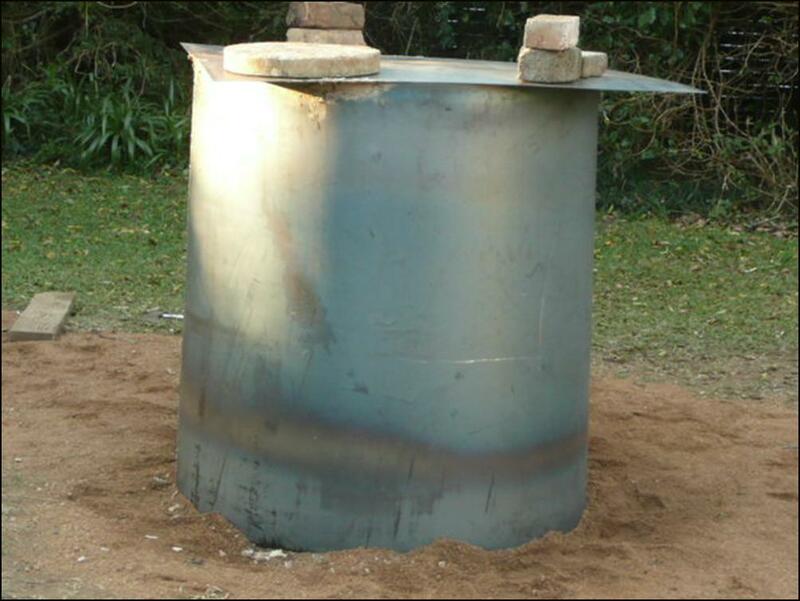 There is another type of steel kiln in widespread use (especially in Africa) that uses a simple air supply system, operating on a reverse draught principle with the aid of chimneys situated around the base of the kiln. It consists of 2 cylinders, a cover and cap, 8 smoke boxes with close-able caps and collars and 4 chimneys. The bottom cylinder rests on top of the smoke boxes and some are left open, have caps on them or chimneys inserted into them. This is a typical down draught (reverse draught) configuration, whereby the kiln is lit at the bottom, air is simultaneously introduced at the bottom as well, for feedstock combustion, with smoke drawn upwards from the bottom with the use of the four chimneys. The process yields approximately 50 to 60 kilograms charcoal per m3 of timber and requires 6 m3 of wood. This method will take 24 to 36 hours to produce the charcoal and to cool off. It requires a larger capital outlay, feedstock and labor requirement. The kiln needs to be made to exacting specifications for cylinders to fit into each other and flanges have to be attached to the lower cylinder to accept the top cylinder. Clearly this is an archaic and smokey way of producing charcoal and yields are often under the 20% efficiency mark. This information was obtained from a user-manual written in 1975 and many advances has since been made in reducing the smoke emitted from the stacks. The full PDF explaining correct use of this system, including construction plans, can be accessed via the Portable Kiln Group’s Google Docs site via links included in Google Group discussions. 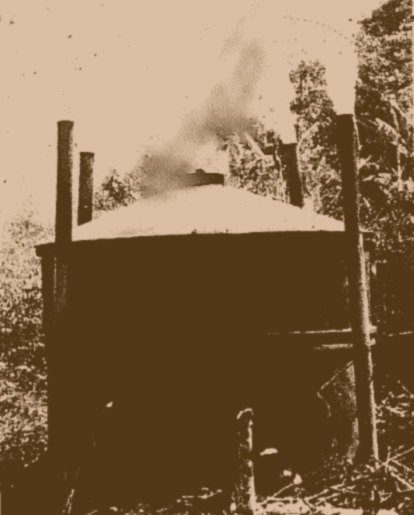 Not much can be done to clean up the initial white smoke whilst the water vapor is driven from the wood, but when the chemical bonds within the constituents of the biomass begin to break, continued heat is required to increase temperature of the now dry biomass and break the molecular bonds. This phase is known as torrefaction and precedes the next phase which is exothermic in nature, i.e. a process that releases energy. Combustible volatiles and hydrocarbons along with tar start to form with the volatiles igniting and supplying heat to the reaction, and when depleted, only charcoal remains. One sees this with uncontrolled open burns, where not much smoke is observed shortly after water vapors are driven out, especially if the fuel is supplied with excess air, but then not much charcoal remains following that burn. 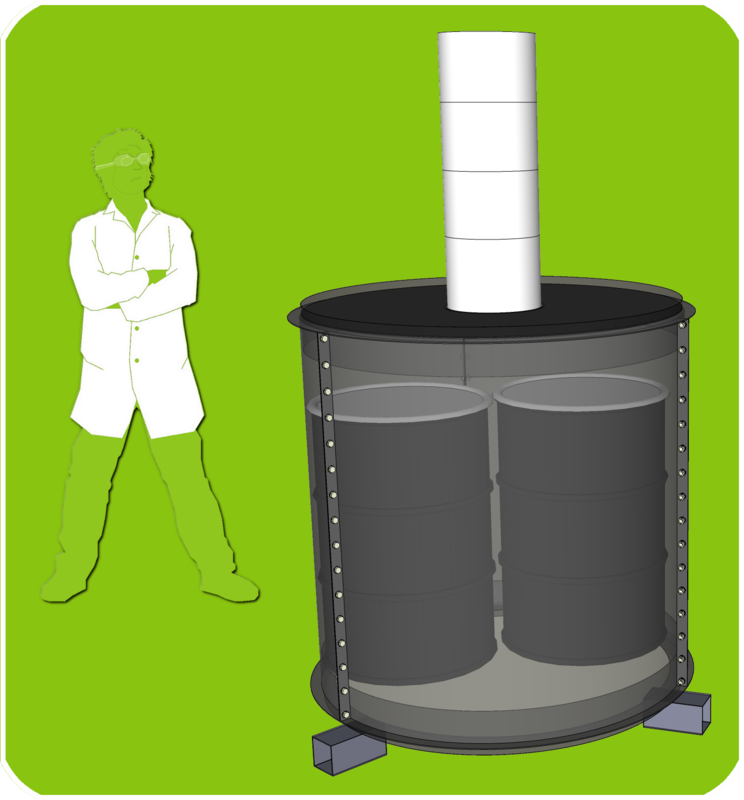 When doing experiments take cognizance of the size and shape of the feedstock being used. For instance if the dimensions of the individual pieces are too small, the material will pack so tightly that no gas can circulate and heat will not penetrate the center of the charge. If the individual pieces are too large there will be plenty circulation, but heat will not penetrate the center of each piece. Attention all international visitors! 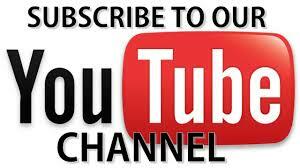 We are registered exporters and all serious enquiries will be investigated for WorldWide delivery. Please click here and send your queries through.